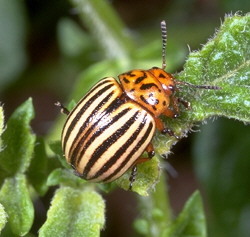 Host plants: Colorado potato beetles are a serious pest of potatoes but are also found to devour tomatoes, eggplants, peppers and other related plants. As the name suggests they were first discovered in Colorado in1859 as native pests to a relative of the potato, buffalo bur but since then have adapted to potato and other related plants. They have now become established in most of North America and Europe too! spots behind their heads and pretty yellow-and-black-stripes on the wing covers! They emerge in spring when the temperature begins to rise after overwintering in the soil. 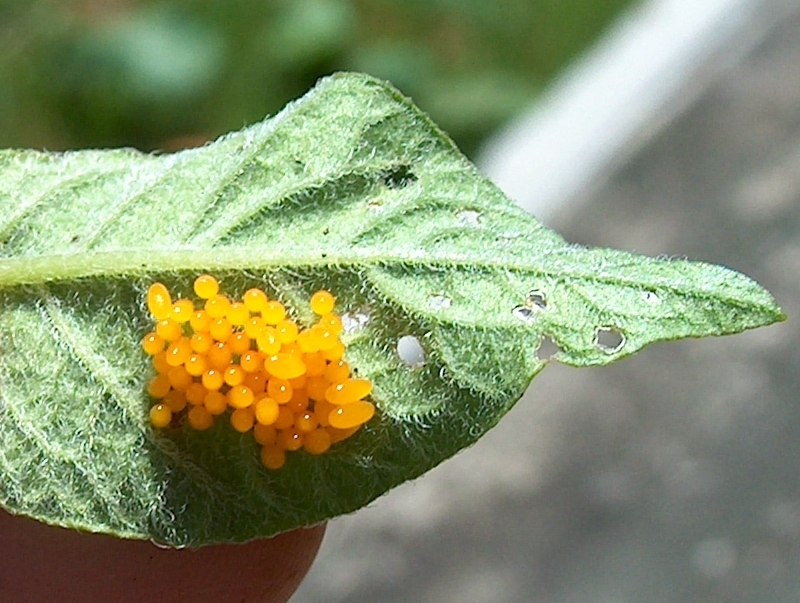 Females lay yellow, oval-shaped eggs on the host plants especially underneath leaves. Each female can lay more than 400 eggs over a month! Eggs hatch in 4-9 days. The larvae look like fat, globular caterpillars and change from brown to pink developing two sets of black spots on the abdomen as they mature. When fully grown (2-4 weeks) the larvae burrow into the soil and pupate. Adults emerge 1-2 weeks later to continue the cycle of doom! Typically 1-3 generations depending on several factors including location, temperature, control etc. 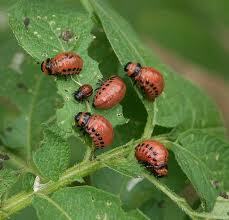 Damage: Colorado potato beetles and their larvae are voracious leaf eaters. They will also feed on shoots and developed flower buds thus inhibiting the plants ability to photosynthesize. An uncontrolled Colorado potato beetle infestation can completely strip a plant of all its foliage in a few days! On the upside, potatoes can tolerate 30% reduction in foliage prior to flowering without any loss in yield. This percentage goes down to 10% once flowering begins! Colorado potato beetle larvae prefer feeding in groups! Row covers- Floating row covers are possibly the easiest and best way to prevent Colorado potato beetles from getting into and infesting your crops. Make sure to secure them to the ground to prevent them from walking through. Crop rotation- This is a traditional means of control. Plant Solanaceous plants elsewhere from where you’ve planted before. Adult beetles overwinter in the soil, come out in spring and look for host plants. Since they aren’t good flyers, having your new set of potatoes at some other location will definitely help. Even in a small kitchen garden, it’s a good idea to practice crop rotation because pests and soil-borne pathogens remain behind from your previous plantings. Handpicking- This is a practical solution for small plantations. Simply scout for adult beetles, larvae and eggs in your infested plants and drop them in a bucket of soapy water or feed them to your hungry chickens! Vacuuming- This is similar to handpicking in the sense that you have to manually search for beetles. There are special garden “bug vacs”, or simply a handheld “Duster Buster” vacuum will do the job. Spot larvae, eggs or beetles? Just vacuum them up! Look underneath leaves for eggs. They are easy to spot! Adjust planting times- Defoliation proves to do the most damage just before and during flowering. Thus planting earlier-than or later-than usual could help offset peak beetle activity. If planting early, use plastic sheets on the soil to warm it up prior to planting and plant early blooming varieties. If your growing season length permits its, delay planting so as to miss a generation of beetles. Natural predators- can greatly assist in managing Colorado potato beetles. Lady beetles, birds, predatory stink bugs, ground beetles, parasitic wasps, toads, lacewings will are natural predators of the eggs, larvae and adult beetle. Set your poultry loose (under supervision of course) on plants over a foot tall and they will eat a stomach’s full of beetles and larvae. Buying beneficial insects like nematodes and the tiny parasitic wasp Edovum puttleri is also an option. Mulching- Mulching with straw or hay helps with keeping tubers out of sunlight while providing an excellent micro-environment for the natural predators of the Colorado potato beetle. Research shows that this will also diminish the beetle’s ability to find your plants. Plant resistant or early varieties- ‘King Harry’ is a hairy leafed potato plant variety that Colorado potato beetles find unpalatable. ‘Russet Burbank’ has been proven to be resistant to potato bugs too. Early blooming varieties like ‘Caribe’, ‘Norland’, ‘Superior’ and ‘Yukon Gold’ are good to plant as bug damage occurs most, later in the season. Trench trap- Dig a nearly vertical trench about 4-6 inches deep and 4 inches wide around your potato bed. Line it with a plastic sheet. This trench will trap migrant beetles that fall into it and can prevent early colonization. Companion planting- Coriander, dill, fennel, sweet alyssum, buckwheat and cosmos will attract beneficial insects. Inter-planting catnip, sage or tansy supposedly deters the Colorado potato beetle. Organic pesticides- Beauvaria bassiana is a pathogenic fungus that is widely used to eliminate Colorado potato beetle infestations. Btt (Bacillus thuringiensis tenebrionis) is another organic pesticide that has high selectivity for Colorado potato beetles and is not toxic at all to humans. Both are most effective against young larvae, hence timing of usage is crucial. Spraying neem oil on leaves also helps. Cabbage maggots or cabbage root maggots are sporadic pests of various cole crops and a few root crops including cabbage, broccoli, cauliflower, Brussels sprouts, turnips, radishes, kale and rutabagas. They may occasionally attack beets and celery! Adult cabbage root flies emerge from the soil in early spring, fly close to the ground and lay eggs in cracks near plants and on the plants where the plant meets the soil. 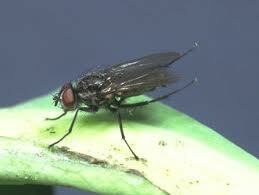 The flies are slender, long-legged and dark gray with black stripes on the back. They are about half the size of common houseflies making them very hard to spot! The eggs hatch in 3-8 days. Cabbage maggots are small yellowish-white legless worms that grow to a maximum size of ¼ inch. They feed on the roots of the host plant for 3-4 weeks before pupating in the soil. The pupal stage (brown elongated kernels) lasts for 12-21 days after which the 2nd generation flies emerge. There may be up to 4 generations a year. Often, infestations aren’t spotted until the damage is already done. Cabbage maggots feed on the root hairs of plants and form tunnels or holes in the roots or tubers of infected plant. This could make the plant look off-colored, sickly, and small and could eventually lead to plant death. While this could be a symptom of nutrient problems or unfavorable temperature conditions, check the roots to make sure! Going about your crops looking intently for the cabbage root fly is the way to go especially in early spring when they are looking to lay their eggs. Use row covers: Cover your seedlings with a very fine floating row cover and ensure that all edges are buried in the ground. This should prevent the root maggot flies from laying its eggs near your plants. Use shields on the ground: Tar paper, weed fabric and old carpets can be used as effective shields against female maggot flies, preventing them from laying eggs around the base of your plants. Plant your transplants through a slit in the shield that is pressed to the soil to ensure no flies can creep in below! 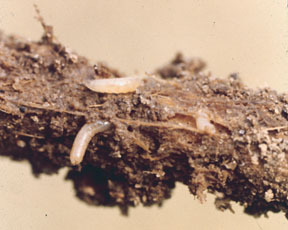 Cultural control: Cultural practices have a major impact on cabbage maggot populations. Tilling the soil before seeding or before the onset of spring will reduce levels of emerging maggot flies owing to destruction of pupae that is overwintering in the soil. Destroy infested plants. Do not use them for composting! Crop rotation will have a positive impact on controlling cabbage maggots, hence must be inculcated. Controlling cruciferous weed species like shepherd’s purse, stinkweed, wild mustard and flixweed that could succumb to cabbage maggots resulting in larger populations of cabbage maggots is another pest management option. Environmental and biological control: Cool temperatures and damp soil conditions are ideal for laid eggs to hatch, thus influencing levels of cabbage maggots. Hence cabbage maggot infestations are very severe in cool, wet springs. Conversely, hot dry conditions do not favor cabbage maggots. If you’re lucky, a naturally occurring soil fungus may attack and reduce cabbage maggot larvae populations. Parasitic wasps, grub-away nematodes, parasitic beetles and rove beetles are good biological controls. Plant later than usual: By doing this you can avoid the 1st and most damaging generation of maggots. Start plants indoors and transplant them into your garden later on in spring. Sticky traps: Yellow sticky traps laced with Vaseline or honey will attract adult maggot flies! Sweep nets are also an option for trapping adult maggot flies. Insect repellents: Mounding wood ash, diatomaceous earth, hot pepper powder or ginger powder in and around the garden have all been used effectively against repelling insects.